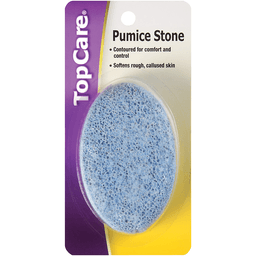 Topcare pumice stone: contoured for comfort and control; softens rough, callused skin; high quality, long-lasting stone. This topcare product is laboratory tested to guarantee its highest quality. Your total satisfaction is guaranteed. Contoured for comfort & control. Softens rough, callused skin. Quality guaranteed.